Ordinarily I like to wait for all the pieces to come together on a finished product but in this case I was so thrilled with this preliminary image that I wanted to share it. 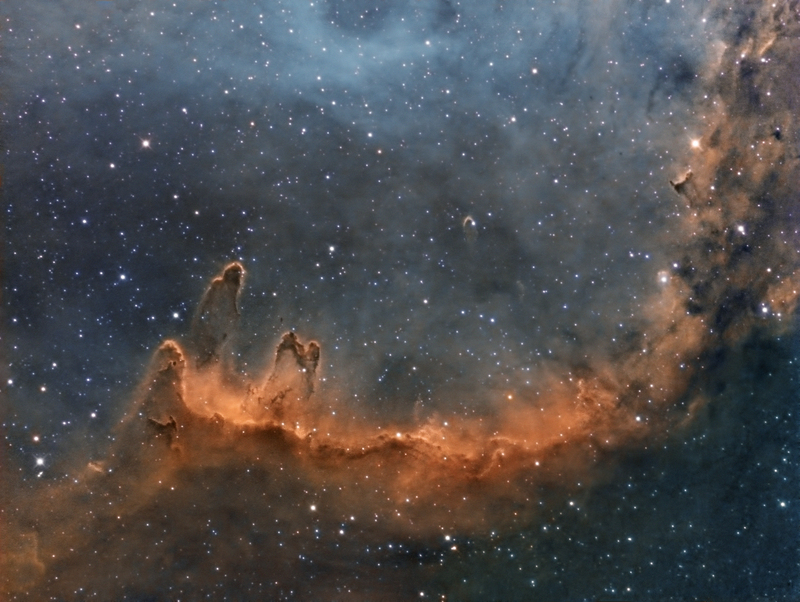 This is a portion of the Soul Nebula. Note that the technical details (see below) gives a break down by temperature. For this image, however, I lumped them all together. I really would like a minimum of 50 darks per temperature bucket. That will take some time. When ready I will re-post with an updated image. One thing that stands out is the 200-second exposure that I used. Initially I tried a "normal" exposure of 50 seconds which I use for LRGB. That led to disappointing results. The signal was so embedded in noise that only the brightest parts were visible in a stretched frame. In my opinion no amount of stacking could save it. I turned to the internet and discovered an "ideal exposure" calculator at Starizona. Most of the cameras in the dropdown were CCD but they did add several ZWO CMOS cameras. I downloaded the code. I found a bug in the implementation of ZWO cameras. They were not taking into account that these are 12-bit and 14-bit cameras, unlike CCDs which are 16 bits. I ran through the procedure they described for finding the ideal exposure for my Ha filter and Altair 290 at unity gain. It converged at 200 seconds. Note that 200 seconds is at the "highest noise" setting of the calculator. I did not run through the steps for "moderate noise" and "low noise" because I knew that this meant even longer exposures, and since I do not have active guiding I was concerned about star drift. Thankfully, my mount was up to the task, and can probably go longer. In a future post I want to do a comparison of the calculator with the Brain. By the way, here is Sara Wager's image of IC 1848 that I aspire to. Temperature-matching disabled until I have more darks per temperature bucket. 75% waning gibbous Moon high in the sky. Last edited by oopfan on Mon Oct 01, 2018 4:33 am, edited 1 time in total. Very good Brian. It looks like long exposures seem to matter when using an Ha filter? Any chance of posting a FITS Liberator, linear and stretched , for a single frame? Congratulations on passing the 300 posts milestone (or is that millstone ?). Attached is stretched and unstretched. The LHS of the histogram never deviates with my images since I always use the same offset for a given gain. For gain 389 I use offset 30, and for gain 100 I use offset 20. I determined those numbers by viewing the energy distribution in bias frames. I found that I need to increase offset as gain is increased. Going forward I will have to make a point of taking a screenshot of SC stretched preview of a frame. Last night I also imaged the Wizard Nebula. I remembered to take a screenshot of it (see attachment) but I forgot to do the Soul Nebula. Both the Wizard and the Soul were captured with the same gain and exposure of 200 seconds. My impression was that the Soul is a fainter target. I could definitely see nebulosity but not to the extent as the Wizard. While I switched the topic to the Wizard Nebula here is a quick stretch of a stack of 26 Ha frames. Just like the Soul Nebula I did not have enough dark frames to do a proper "temperature match" of lights and darks. From Photoshop Astronomy by Stephen Ireland, page 43, discussion of 'Combed' or 'Gapped' histograms. I have noticed that sometimes my stretched histogram (on the test frame, analysed prior to a run) has gaps when stretched. If I increase the offset, I end up being able to stretch without any gaps in the histogram. Any thoughts on this? Regarding the pdf and the difference in the appearance of the histogram between offset 50 and 150, it is an illusion that the "combing" disappears. Imagine if the authors of FITS Liberator gave us the ability to resize the window. I can guarantee you that if I were allowed to grow the width of the window and consequently grow the horizontal axis of the histogram that "combing" would reappear. Furthermore, no matter how large an offset you inject it is going to be subtracted out during the calibration process. Take a bias frame and look for the minimum value in it. Is it at least, say 100 and less than a thousand or a few thousand? If so, your offset is fine. If it's too low, boost the offset. If it's high, drop it. Repeat until you have a bias frame with an offset in, roughly 100 - 1000. Don't worry about precision here, it won't matter at all in the end. You now know your offset. Set it and forget it. Never change it. There is a huge upside to this. It enables the creation of a dark frame and bias frame library. To me, one of the least appealing aspects of AP is capturing darks. Bias frames go fast but darks take forever especially with the long exposures that we take. I take Dr. Stark's advice a bit further. I take a bias frame as he recommends but I look at the energy distribution in the histogram (see attachment). I want to see what is shown here. I want the energy distribution, from tail-to-tail, to not be distorted or clipped. For this particular example I used Offset 30. If I reduce it to 25 the distribution shifts leftwards and it becomes non-symmetrical about the mean but no clipping yet. If I reduce it to 20 then the clipping begins and it gets ugly. I still hold the belief that increasing Offset over 30 adds no value. Of course I welcome the opportunity to be proven wrong if it improves my AP. Thanks for this Brian. I checked a bias frame with offset=50. This was from an Altair 183C. It seems to satisfy your (and Craig Stark's) criteria with min=592 and even balance. I will try for a run with offset=30 and report back. I had a good read of the Craig Stark article that you linked to - very informative. Of course it doesn't take long to acquire a bias frame, so is worth checking before imaging. This past March (7 months ago) I measured what I call "minimum offset" for a range of gains. Occasionally I snap a bias frame to see if it still holds true.